Errol: I would have made a comic of this sooner, but it’s been a harrowing few days. When I learned about this, I was pretty much useless for the next two hours. I couldn’t do anything productive except for squealing. I did blog about it though. When the pinnacle of your geekery has been reached, you have to commemorate it somehow. Oh, and who is that with Debs? Not your sister at last is it? He emailed you! Man! That’s even better! 😀 And that’s Debbie Ohi, I updated the post. Thanks! To sapient who doesn’t even know me – thanks for noticing that Errol has neglected his poor sister. I’m actually touched. But as an FYI, that character could never have been me because he made her too happy. Ya, normally she’d be mad at me. I hate to burst Errol’s bubble (well, maybe I enjoy it just a little!) but doesn’t Neil tweet about a hundred times a day? Okay I just looked an there’s only 40-50 or so in the last day (maybe he’s busy writing a new book! ), and MOST of them are mentions of other peons peeps like Errol. So Errol is just one of thousands of NeilFans who get some kind of response back from that big-name superstar author they’re such big fans of. Actually, I don’t think that bursts Errol’s bubble at all. He is that much of a geek that being one of thousands (or even tens of thousands) of fans who was tweeted by Gaiman is still something he would squeal about. Yeah i have somewhere between 20,000 and 30,000 comics in total i think. Most of them from the 20th century. Actually, my main areas of interest are: any US comics from 1938-1952, Archie Adventure/Red Circle/!mpact, Justice Society Of America, and The Spirit. Oh and Gary Carlson’s Big Bang Comics too, mustn’t forget those! *LAUGH* That’s great. 😀 See, back in the day, when email was young and you didn’t have to worry about things like… spam and Nigerian princes, you could send off an email to someone, and it was exciting. Haha, brilliant! 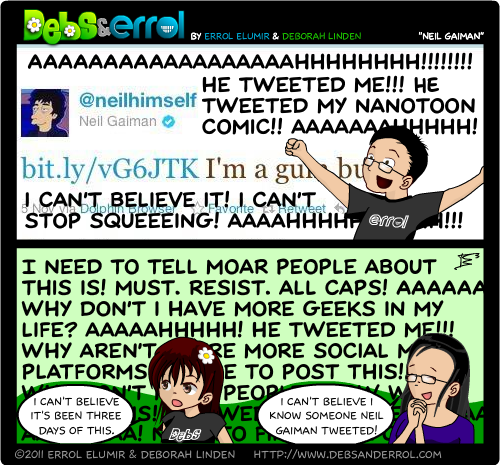 I can very easily relate to this – I have extremely vivid daydreams of Neil Gaiman stumbling across SMASH and sending one teensy little tweet about it, then watching our readership explode. Congrats to you! See? See? I knew you guys could relate to this! 😀 It’s all so very exciting!